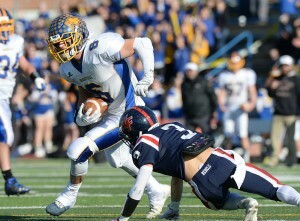 WEST HAVEN – As advertised, the Class M final between South-West Conference rivals Brookfield and New Fairfield boiled down to a game of defense, field position and key mistakes. Brookfield, the team with a much longer championship resume, didn’t make any key mistakes. New Fairfield, playing in its first final since 1983, made only two plays it would like to have back. 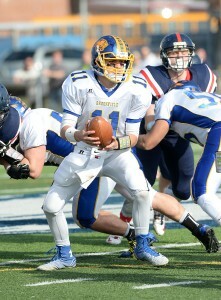 But they were the difference as Brookfield repeated as state champ Saturday in a 21-14 victory before 4,500 fans at West Haven High. Brookfield (11-2) won Class M-Large last season. It is the school’s fourth CIAC title. New Fairfield (11-2) led 7-0 in the second quarter when Brookfield’s Nick Seis forced a fumble and Robert Drysdale recovered at the New Fairfield 37. Six plays later, Bobcat quarterback John Roscigno hit Seis for a 26-yard touchdown pass to tie the score. With the game tied 7-7 midway through the third quarter, New Fairfield coach Anthony Fata made a decision he said he regretted later. Facing 4th-and-1 at the Brookfield 45, the Rebels went for a first down but were stopped when quarterback Mike Zanca was stuffed by Nick Acquavita, Zach Delia and Drysdale. Four plays later, Drysdale (17 carries for 92 yards) ran 32 yards for the go-ahead score with 5:33 left in the third. Brookfield padded the lead to 21-7 with 4:30 left on Harrison Manesis’ 9-yard run. The key play in the 10-play, 69-yard drive was a third-down, 26-yard flea flicker pass from receiver Mike Martinkovic to Dane Borges, the Bobcats’ ace kicker who is also a backup receiver. It was Borges’ first catch of the season. New Fairfield cut the gap to 21-14 when Mike Zanca fired a 14-yard TD pass to Rudy Sarro with 1:56 left. Sarro and Zanca hooked up late in the first quarter for a 35-yard TD pass on 4th-and-9 for a 7-0 lead. Manesis grabbed the on-side kick after Sarro’s second touchdown. Brookfield made one first down and ran out the clock. Brookfield amassed just 198 yards in total offense, but its defense bottled up New Fairfield’s 2000-yard rusher Zach Tripodi, holding him to 84 yards on 33 carries. Drysdale, who will play at Harvard next fall, ends one of the state’s most legendary careers with over 60 touchdowns and 5,000 yards and two state titles.